Flammable Safety Cabinets vs. Outdoor Chemical Storage Lockers – What is the Difference? Meet the standards of the Occupational Safety and Health Association (OSHA) and the National Fire Protection Agency (NFPA). Experts develop these standards based on thorough research and investigations into past incidents. Following these codes raises the standard of safety within your organization. It also helps companies avoid steep fines due to con-compliance. Buy certified equipment. Underwriters Laboratories Inc. (UL) and Factory Mutual Research (FM) test equipment to check that it meets regulatory standards. Purchase equipment with their approval to lower the risks of equipment failure. A pressure vent or safety drum vent has two functions: it allows air to enter the drum during dispensing, and prevents the formation of a vacuum. But, it also acts as a safety device to relieve pressure from the drum. Drum contents heat up during a fire. Without a pressure vent to relieve pressure buildup in a drum, it will eventually explode. Use antistatic wires to connect a metal drum to an electrical earth. This provides a path for electrical current to flow away from the flammable liquid storage drum. Without grounding, static electricity builds, creating the risk of a spark and possible fire. Static electricity also builds up between two metal containers while dispensing flammable liquid. Use antistatic wires to bond containers to each other, creating a path for electrical current to flow. Bonding containers together eliminates static electricity – so, no sparks, no fire! Properly connect antistatic wires to the metal surface of the drum. Wiggle the alligator clip connections on the metal so that the teeth penetrate any corrosion or coating. Only a metal-to-metal contact guarantees effective grounding and bonding. Distractions come at any time and during any activity - even while dispensing product from a 55-gallon drum. Use a self-closing faucet to prevent distractions from resulting in a spill. These automatically shut off when you take your hand off the mechanism. Store 55-gallon drums on spill pallets to catch any drips or leaks. Or, use a spill caddy to carry an individual drum. They feature specialized compartments to contain spills. Place a spill tray underneath a drum on a horizontal stand to catch any drips or spills during dispensing. Uncontained spills are fire hazards because they are open to ignition sources. They also create slip hazards for employees. 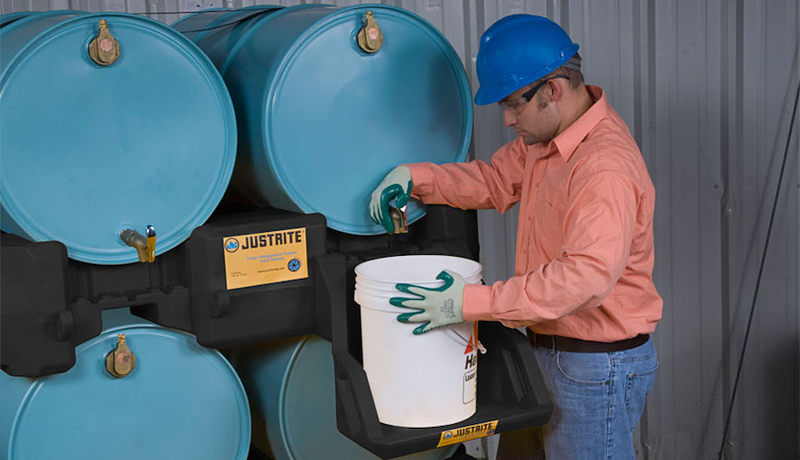 Justrite supplies solutions for 55-gallon drums with approved equipment to meet your needs. Find our drum funnels and equipment here and our guide to safe handling of flammable liquids here.